What truth, Lance. Actually, we’re all dying every day, and therefore we should be living just as much every day. Hi Lance. This reminds me of the movie The Bucket List. Did you see it? It illustrated this concept very well, and… I’ll pretty much watch any movie with Jack Nicholson in it. I like the photo you’ve chosen. They’re practically flying. When I read this I wondered, ‘what is fun’? Then I considered if I could choose between doing something that I found fulfilling/satisfying/worthwhile or fun which would I choose? Interestingly my answer is the fulfilling stuff, but it is not clear cut. Because I find that satisfaction/fulfillment comes from enjoying what I have done/doing, which can’t be that far off from being called fun. I guess it is a particular personality trait. Hi Lance – This is a wonderful quote (and perfect picture). I often think, if today is going to be my last, how do I want to live it? When I think about it, there’s no room for pettiness or hatred. Life is meant to be lived and I try to squeeze as much as I can into each day, including lots of fun, laughter and kindness. Randy Pausch was a remarkable man, wasn’t he? Ross´s last blog post..Career paths vs happiness: which road are you on? Pleasure is a state of mind. It is relative. Human beings often evolve to understand what fun is not before they grasp what it is. Life experience is a teacher. Liara Covert´s last blog post..Why resist the inevitable? A friend lost her YOUNGYOUNG husband this weekend but he was an inspiration to me for how to live life. Im playing today. in his memory and for my daughters MEMORIES. MizFit´s last blog post..What the (bleep) do we know?! what great advice Randy has left for all of us. He seemed to see it all with such clarity……God bless him for passing his wisdom on to us and doing something so generous for others! @Davina – The Bucket List – yes, I’ve seen it! It’s what spurred me on to begin writing! I love the concept behind that movie! And yes, I love that photo too – it just screams “happy” to me! @Jarrod – Fulfillment — yes, that’s really an important aspect also. Fulfilling says to me – it’s meeting some deep desire that I have. And that truly is important. Can something be fulfilling but not fun? I think so. I know it can be both at times. I also think that sometimes it’s good just to have some “goofy” fun – to let go, be a little crazy, act a little weird. This might not be deeply fulfilling – but it will still just feel “good”. @Barbara – Yes, I think this picture fits to the quote just perfectly – happiness is just radiating from the photo! You’ve got a great attitude for making each day matter – including getting some fun in there! And, yes – Randy Pausch was an amazing individual – what he did in the presence of what he was facing was really awe-inspiring. @Ross – I try to make each day have some fun in it. I’m not sure I’ve always done this, but I do now. Randy Pausch is a great example of doing this – and doing it in spite of the many issues he had in front of him – a death sentence included… I will make today fun (you too!)! @Liara – Pleasure is relative – what it is for me, it might not be for you. I guess, finding what it is for us, each, individually – is the key. And life experience is a great teacher in that! @MizFit – That is sad, Carla. And a strong reminder – that life can end at any time. Life. Live it. I’m playing today too. And you’ve given me great reason to do that. @Annette – Randy was an image of light in a dark world he faced. Maybe clarity comes when we’re given a death sentence? Maybe life, and what is important, stands out more. I think, though, he had it all along. I wonder how close I am to having that kind of clarity in my life. Lots to think about – and an important point today – have fun! Enjoy your family today Annette! Funster philosophy certainly resonates with me. I Googled Randy Pausch and he see was very inspiring to many with his “Really Achieving Your Childhood Dreams.” What a guy in the face of his cancer. I love having fun and making the everyday experiences fun. Sometimes the most simple experience can be so much fun. A walk in the woods, sitting under a star lit sky, a surprise kiss from a lover, a whispered message from God. All of these can excite a heart in a fun way. But I believe sometimes you just need someone to pin you to the ground and give you a good tickle attack! I need to have some fun today. Thanks for this reminder Lance. You’re a timely man with a huge heart! I love that quote! That whole speech and book are an inspiration to everyone! Katie´s last blog post..Nothing but respect…. Fun is even more of an energetic, emotional expression than any of the others: anger, crying, moping, worrying… At least I think it is. 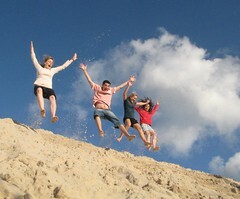 With the kind of fun depicted in the photo, Lance, we feel almost bodiless, so open and free… Joy is palpable! Just think of all the cells in our bodies dancing and laughing… How could we not feel better! And I can’t think of a single other activity that brings such LIFE to us. Some are close, but aren’t as all-consuming as that kind of super-charged fun. What a great way to end/start the week, Lance! Thank you! I loved Randy’s book. I appreciated his new take on old concepts like creativity, family, and encouragement. He lived his life to the fullest and his kids will always have a role model because of the videos, book, and stories he left behind. Beautiful. Life is all about having fun! Hi Lance: This reminds me of a quote I ran across while stumbling yesterday. A kid was asked “What do you want to be when you grow up?” and he answered “happy”. The teacher told him he didn’t understand the question, and he told the teacher she didn’t understand life. It’s about being happy and having fun! Great quote for the day. Life is about living isn’t it. We have one shot at it and that is now. Great quote Lance as we are all dying and I think the point of life is to have fun and be happy. I think this confusing for many people who spend too much time thinking and analyzing and less time feeling. I think if we teach our kids to FEEL, then they will find it much easier to have fun and enjoy their life, watever their picture of success is. Happy Sunday Lance! This quote is a great way to start the week. The word “play” is most important here. Most people are just letting life happen to them. I love the action this quote implies, not only is he going to be happy, but he is actively searching happiness and fun out. Randy knew how to live and die. May we all be so fortunate – starting today! Great quote Lance. Randy’s a really inspirational guy. @Meleah – Hey, that’s great Meleah – enjoy your time away (and have loads of fun)! @Jannie – Ha! So, you’re surrounded by “Fun” all the time!! Randy was an amazing individual – if you haven’t seen the video, take the time to watch it – it is such a powerful example of “living” life. I’ve also read the book he wrote, as well – great stuff all around! @Laurie – Those are all great ways to have fun! I love the “tickle torture” — it’s so much fun to get the kids this way! For some reason, they don’t think it’s as “cool” anymore, now that they are getting older…and my wife…not ticklish (usually)…but it’s still worth trying – because sometimes… Thanks Laurie! @Mark – It WAS a fun day today – lots of basketball, a little fire in the backyard, a trip to the woods…all fun stuff! Hope yours was, as well! @Katie – I struggled to pick a quote this week – I knew I wanted to use a Randy Pausch quote, and then just had a very hard time choosing – in the end – I too, loved this one! And yes, I second what you’ve said – his “last lecture” presentation and book are both amazing resources on how we should live our lives! @Julie – Yes, the picture just really seems to portray freedom and joy, and in such a wonderful way! And I couldn’t agree more, Julie – true joy and happiness really do bring “life” alive – more so than anything else I can think of! And isn’t that feeling great!! @Karl – Yes, in a way Randy was lucky. Not in that he got cancer, and that it claimed his life. But in that he knew he had this death sentence. And then he took the time to create memories for his children that they will have for a lifetime – and he did this all in the face of knowing his time was coming to an end. And, I agree – his book is an amazing story of achieving your dreams and living your life! @Akemi – Like the world is our amusement park – how can we not have fun if we think of it like that — that’s very cool Akemi! @Marelisa – That’s an awesome quote, Mare! That child has it figured out – because what kind of life is it, if we’re not having any fun? @Tammy – Now IS the time Tammy…now IS the time! We just never know what lies ahead, all we can be sure of is this moment in time – and making it fun sounds like a pretty great way to enjoy “it”! @Audra – Hey Audra, happy Sunday to you too! “May we all be so fortunate…” – yes, Audra, may we all be so fortunate as to live our lives the way we desire to. Randy did it right, even in dying. “Play” is an important word – because it means we have to do it (play) sometimes to have fun – it doesn’t just happen to us by chance. That’s a great point Audra! @Cath – Thanks Cath! Randy was so inspirational, and it’s very sad he has departed this world – and yet, his legacy remains – through the many great things he did! love this quote, I need to remember this when I get stessed, and forget life is for living!!!! Lance that is such a powerful message and thank you so much for sharing it with the world! We cannot get sick or too tired of hearing it. We cannot get bored of hearing it, because the truth is most of us are not hearing it! There really is no better way to live and most of us are so afraid to try living this way but it really is soooo good, so freeing and just so US! I love Randy! Thanks for the Sunday thought, Lance. The challenge for me is to introduce fun even into everyday routines. Aside everyday routines, I’m so glad that I’m doing something that I love. It’s much easier to inject humor & to take things less seriously!! Oh how important it is! I used to get very buried in the “I gottas” and now I am finding a nice balance between getting things done and making sure I have time to just be silly with my kids or do something else I enjoy. What helped me was reminding myself “Yes, it is wonderful you love what you do – but you’ll be much better at it if you take a break and do something else for a while”. Thanks for the great quote! Hi Lance! Thanks for this wisdom that has arrived on a perfect day, of coarse. @Bobbi – I need to remember it too, Bobbi – live life, have fun, play! For some reason, I think you’re doing it…already. @Evita – Sometimes we just drudge through life, doing what we’re told to do. Get up, go to work, come home, go to bed — repeat. And for what? Our moment is now. Indeed, that’s all that’s guaranteed. Why do you think we’re afraid to live this way? I think it’s tied to us not wanting to look “different”, to us being afraid of stepping out of our normal-ness we’ve accepted, to us not wanting explore areas outside our area of comfort. Evita, this is just such an excellent point you bring up. Thank you – it’s making me really think about what holds me back sometimes from having fun. And, a very happy Sunday to you too!! @Writer Dad – Randy is great isn’t he – thank you Sean! @Evelyn – Where there is love, fun is usually not too far behind. Finding ways to make everyday routines fun – I love that idea Evelyn! What a great way to make the normal and mundane into something fun and enjoyable! @Jenny – Great point, there is a balance – and we sometimes have to be serious and get things done. But that must be balanced with silliness, fun, joy, laughter, etc. That is what makes life worth living. Breaking away – I did that tonight with my kids – we played a fun game we’ve made up – and essentially we run wild through the house. It’s a game they never tire of (although I get tired playing it). There’s always laughter and surprise – and it’s also a game I thought they would outgrow as they’ve gotten older – but no – everyone still loves it! And it’s because…it’s FUN! And it was good for me too – to break away and get into something fun and crazy – just like you’ve suggested! I like how Linda put, “We’re all dying everyday, and therefore we should be living just as much every day.” Like you said, you never know when the end will come. Every day, we’re one step closer to death, so we need to keep that in mind as we strive to live life to the fullest. Thanks for this reminder as I can often forget to stop and have some fun. Jennifer´s last blog post..Do You Feel that is Right? Randy inspired so many – it is amazing what he did for all of us in his last days. I have watched Randy’s last lecture over and over again – and I cannot believe how much fun he was having – in spite of knowing that his death was so close. But I guess death was the reason he was having so much fun. Everyone but he wept as he ended his speech. The funny thing is that I do not think I would have changed anything in my life if I knew, like Randy, that I had just a few months to live. And I am really glad I feel that way! @Maya – Randy lived life to the fullest, right up to the end. It was a wonderful story, because it reminds us all that “fun” is important. And, that’s awesome, Maya, that you are content and fulfilled with where you are in your life right now – what a great feeling! 🙂 I obviously agree…the subtitle for Cheerful Monk is Happiness as a Spiritual Practice. That phrase is a great reminder for me. Oh how I wish I could put all my responsibilities aside and just play all the time. I “work” on playing every day. Like life balance, being playful is a choice. We must choose to play. @Jean – Yes, you are very much all about happiness! Give me fun any day! There are plenty of days when I just want to walk away from what I am doing and find something fun to do! Of course what really gets me is when I have the time, I can’t always remember the stuff I wanted to do that was fun. Like go and sit in a park for hours just sitting and being. I love to have fun and most of the time it’s easy to find, I just need to remember that I can have fun by myself and don’t always have to include others. Having fun is important. I try to do something fun every couple of days because it seems like most of the time is just dull boring daily grind. I like to get out and ride my bike or the motorcycle or have a few cocktails. But I do try and get something in that’s fun and different. Paunchiness´s last blog post..Where Do Thanksgiving Turkeys Come From? @Jenny -Good point Jenny – fun doesn’t always have to involve others. It’s great if it does, but it can be equally as great to just have some time to ourselves. So, let’s have some fun every day, right Jenny!! @Paunchiness – Sometimes fun is the “regular” fun we have – stuff we’ve done over and over that we enjoy. And yet, other times – it’s the “new” stuff – great point! Nice quote. This is something we all need to remember on a daily basis!